Kansas Governor Brownback has invited me to Topeka to speak about “Damascus Countdown.” Please join us at the State Capitol on Sept. 7. 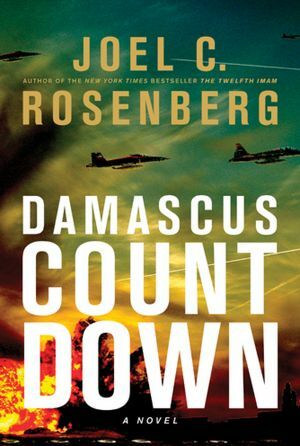 (Washington, D.C.) — Governor Sam Brownback and his wife, Mary, have invited me to speak about my novel, Damascus Countdown, at an event at the Kansas State Capitol in Topeka, and I am honored to accept. The event is the 3rd Annual Kansas Book Festival. It is free and open to the public, and will take place on Saturday, September 7th. I am scheduled to speak at 1:30pm in the House Chamber (details here). I’ll be discussing why I wrote the book, and the latest developments and trend lines in Syria, Iran and the broader Middle East. The event will last about an hour, including Q&A, and will be followed by a book signing. Governor Brownback and I first met and became friends when he served here in Washington, first as a Congressman, and then as a U.S. Senator. During his tenure, Brownback served as chairman of the Senate Foreign Relations Committee’s Subcommittee on Near Eastern and South Asian Affairs. He is a great friend of Israel and took a serious interest in issues related to Iran, Syria, Sudan, and the threat of Radical Islam. >> To listen to the latest podcast of Syria & other Middle East develop, please click here. >> To learn more about The Joshua Fund — and/or make a tax deductible contribution to bless Israel and her neighbors with food, clothing, medical supplies, and other humanitarian relief, including war preparations; to provide humanitarian aid to refugees fleeing Syria; and to educate Christians around the world about how to be a blessing to the people of the epicenter — please visit our website, www.joshuafund.net. « U.S., British release intel reports of Syrian chemical attacks. (Read full texts.) More than 1,400 killed, including 426 children. Now what?